Goodwill Industries of North Florida has proudly teamed up with the Girl Scouts of Gateway Council to help teach the importance of recycling and philanthropy with the Good Turn for Goodwill program. 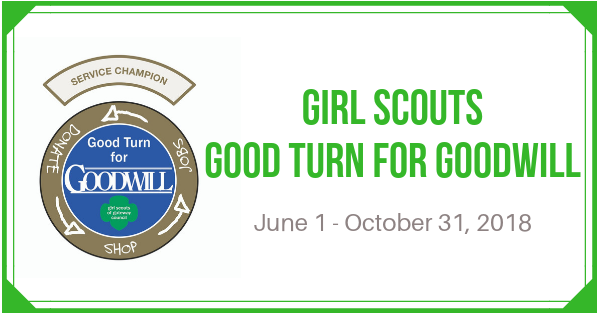 Every Girl Scout has the opportunity to earn a Good Turn patch and compete for individual and troop grand prizes! Please see below for details. This program runs from June 1 through October 31, 2018. Every Scout who turns in FOUR or more 13-gallon bags OR copier boxes of donations between June 1 and October 31 will receive a Black Border Patch. Every Scout who turns in 25 or more 13-gallon bags OR copier boxes of donations between June 1 and October 31 will receive a Silver Border Patch. Every participating Scout in the Troop with the most donated bags or boxes over all other Troops from June 1 to October 31st will earn a Gold Border Patch. Any individual Scout can earn a Good Turn Rocker in lieu of an additional patch for consecutive years of participation with a minimum donation of 4 bags/boxes. Print out a donation form and complete it before taking your donation to a location. Tell the attendant you are participating in the Girl Scouts: Good Turn for Goodwill program and ask them to sign your donation form. WE DO NOT NEED THE FORMS YOUR SCOUTS TURN IN TO YOU. THESE ARE FOR YOUR RECORD KEEPING PURPOSES ONLY. Please provide an address to send Troops' patches. If there's anything else you'd like to note or an alternate contact method, please include here.